I like this idea very much ! It should be rather easy to implement. And if I may add a wish, there should be an "easy" way to modify existing .REG files. should all behave the same, BUT a .REG file not necessarily is operating on a single "backing file", so it would be IMHO more useful to have a converter to make *any* .REG compatible for "online use" and then use it with the "offline tool". I am looking for expertise around partitions and specially around extended partitions. In both cases, all partitions are seen ok by windows. Still although I can live with the fact they are created in a different way, it gets my life difficult when I want to delete them with CloneDisk. Basically, windows will create, for each new partition with index >3, an extended partition with number=0. Deleting then, with CloneDisk, any partition with index >3 will generate unexpected result. Note : if it may help, from a dev point of view, I am using windows IOCTL's IOCTL_DISK_GET_DRIVE_LAYOUT_EX/IOCTL_DISK_SET_DRIVE_LAYOUT_EX. I am not sure to understand (actually I am sure that I don't understand). In a MBR there can be as much as 4 partition entries. Of these, they can be either 4 primaries or 3 primaries+1 extended (and then you can make inside the extended as many volumes you want, as a "chain" of partitions/volumes is used). It is very possible (and it may additionally depend on the actual specific NT OS version) that disk management will behave "queerly". In XP I can create 4 primary partitions fine. -In CloneDisk, it seems that I can create as many (or least more than 4) primary partitions. They are numbered from 1 to x. No pb there : create and delete will be fine. Thus : is this ok (by the book) to create N primary partitions without ever using an extended partition? 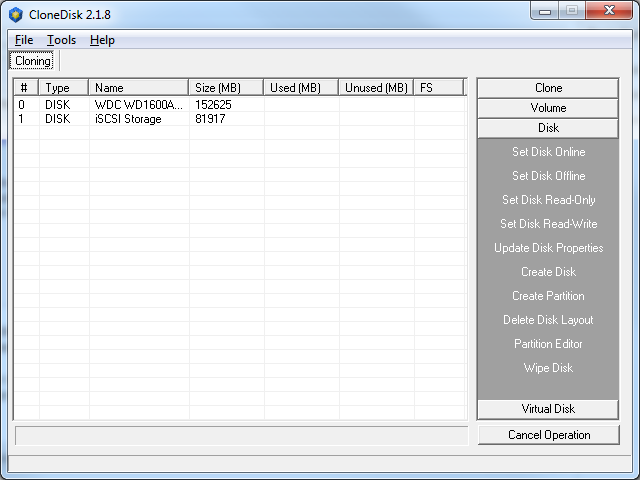 -In windows (7 here), it will create 3 primary partitions, then 1 extented partition and in there X logical partitions. CloneDisk will then see for each logical partition one extended partition rigth before (numbered 0). So already the view between Windows and CloneDisk is different. The numbered 0's I cannot delete without unexpected result (altough I used the index, not the part number 0). The logical partitions, I cannot delete without unexpected result (whether I try with the index or the part number). Thus I am stuck as so far with CloneDisk I cannot (1) create this setup nor (2) delete a partition with index above 3. Cannot say what/how clonedisk does, all I can do is provide some info. The MBR has 4 partition entries (and thus you cannot have more than 4 partition entries in it, these can be either max 4 primary or max 3 primary and max 1 Extended). By convention you cannot have more than one Extended partition. The Partition ID for the Extended partition must be either 05 or 0F. Whilst an entry for a primary partition points to a PBR (Partition Boot Record) or Vbr (Volume Boot Record) i..e the bootsector or first sector of the volume, the entry for the Extended Partition points to an EMBR (Extended partition Master Boot Record) or EPBR (Extended Partition Boot Record). The EMBR has a structure similar to the MBR. In practice the Extended partition is made by a "chain" of EMBR's each one with two entries, the first being the volume inside and the second being the the next EMBR (if more than one volume is present. So, if you have more than one volume in an Extended partition you will jave an EMBR1, and EMBR2, etc. since the site is not working properly I am attaching it in a form that is viewable offline. strangely enough the good MS guys provided a clear enough set of documentation and images. I've been having errors using Offline Registry > Redetect Hardware. Tested under WinPE XP. Does not seem to work and error is something related to system.bak. Registry can be accessed offline by other tools. Someone else can reproduce this error? I wrongly assumed there was one extended part and several logical drives attached to it. The graphical representation of the different partition managers mis led me. I believe i can now delete and create extended partitions fine in clonedisk. Hence clonedisk renaming in the background the initial file to .old and the .bak to the initial file. Seems that in your case this not working. Are you running clonedisk from a read only media? Would you have a screenshot or error log? Running Clonedisk from a read/write media, a flash drive. Had no issues acessing offline registry using another tools. Get me a screenshot if you can. CloneDisk now supports the new Windows 8.1 update 1 wimboot flag. See a discussion here or here. Note : I had to perform a bcdboot c:\windows /s c:\ after step 5. Not sure if this is related to my installation (no reserved partition). -My clean install is around 13 GB. -My wim file is around 7 GB. -After step 5, i have "only" 3.5 GB occupied on drive C. of which near 3 gigs are taken by hyberfil.sys, pagefile.sys, swapfile.sys. while (and when) you are at it, with a low-low level priority, can you see, since you added the Volume Serial change to add something to view (and change) Disk Signature? I could have patched the bytes in the MBR but as I am playing with MS IOCTL_DISK_SET_DRIVE_LAYOUT_EX ioctl these days I took this road and it works all the same . At long last, I was able to compile CloneDisk for X64 environements as well. My drive was to use it from X64 WinPE's. For now the X32 and the X64 as developped under a different version of delphi. My personal dev computer not being migrated yet to X64, it means the X32 will always be more up to date for the next weeks. Following a discussion here, around imaging speed, I made a small change (increased buffer size) which on my initial tests shows a 30% speed increase when backuping/dumping a disk to an image file. Does not show much change when restoring or cloning thus. At some point, the buffer size could be a "hidden" parameter as I suspect different setups may be optimized for different buffer sizes. And I believe there is still some little room left for improvement around speed. I really like the recent changes you have made. The disk imaging (Clone > Backup to Image) was fast in a recent test I did in a virtual machine and it's really useful to be able to remove unneeded features from the UI. Is it possible to add the md5 checksum for a disk? This is very useful for verification purposes in Forensic work. Is the Virtual Disk > MD5 Hash feature for the file selected, or the contents of the file (e.g. the MD5 checksum of the mounted disk image - useful for verifying that the disk image and disk contents are identical). Now for some (hopefully) constructive critism. If the default settings are used (e.g. nothing is removed from the UI) then it's very easy to accidentally select an option when using the scroll buttons. As a (potentially dangerous) example if I select the Disk menu and then keep clicking on the bottom arrow to scroll through the Disk menu options I keep clicking on Wipe Disk when the arrow disappears. MD5 Checksum on a disk? You mean on a physical disk or volume? Need to check this but a handle is a handle so I guess pointing to a file or device should not make much change. To answer your question, the current MD5 hash in CloneDisk works against the content of the file from first byte to last byte. About the CloneDisk GUI, indeed I have been reported a few times already that scrolling down and up the outlookbar could sometimes leads to error. Will look into that ! 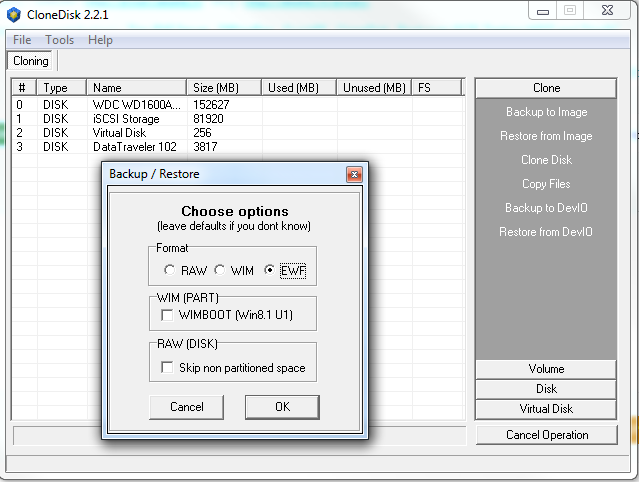 Two quick "How to backup" with CloneDisk using QuickPE (or any WinPE). This one using a windows share. This one using DevIO (from Olof) : a method which I like a lot for its speed. The two (one) links are to same page. I took your remark into considerations. Latest version (2.1.8) have been resized to 640*480 and the main screen has been reshaped so that there is no scrollbar in the outlook bar. More over, in the worse case scenario where a user would click a wrong button by accident, there is always a confirmation asked to the user. I've been distracted with testing and haven't checked this new version out yet - thanks however for the UI changes. My recent tests on WinPE RAM requirements included a number of tests running Clonedisk on WinPE in low RAM virtual systems - see here for the results. Clonedisk updated to version 2.2. Latest version (2.2.1) can backup/restore to/from EWF (encase file format). When imaging a physical drive, you better zeroed out the unused clusters. I had a 4GB usb key with 256MB datas on it which I have not fully formated for a long time : EWF backup file was 3.2 GB. I have wiped it, done my backup again : EWF backup file was < 256MB.